The Avanos MIC* Percutaneous Endoscopic Gastrostomy (PEG) Feeding Tube Kit is designed for placement convenience and comes in complete placement kits for both the Pull and Push placement methods. 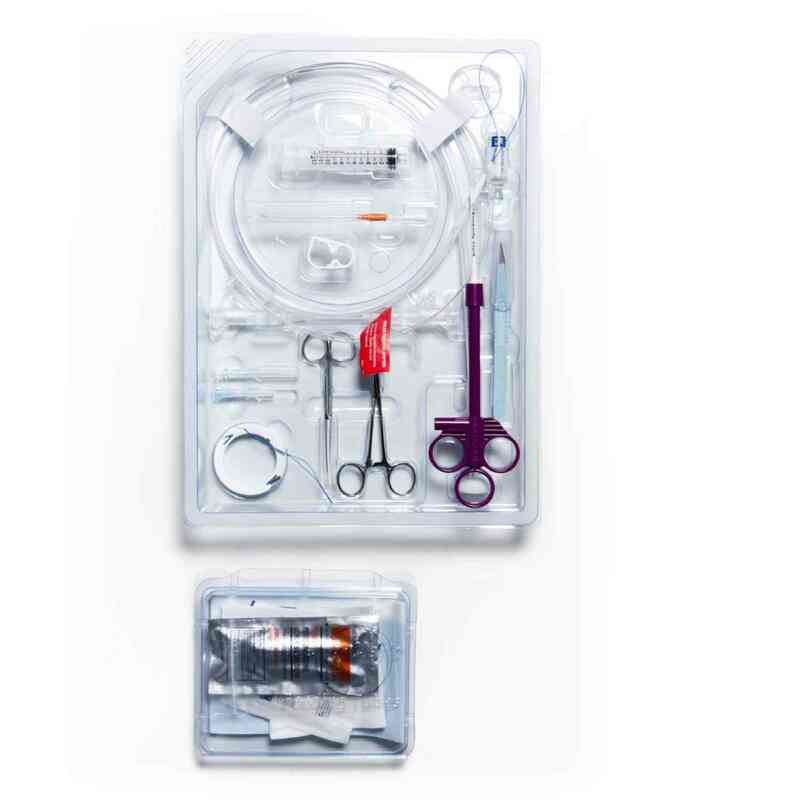 The comprehensive kit includes many major components including bolus and universal feeding adapters, a tubing clamp, placement wire, a SECUR-LOK* retention ring, accompanying needles and sponges, and a traction removable Pull PEG tube. Please look below for a full list of included items. Available in 14, 20 and 24 French sizes, the MIC* PEG is traction removable. Help Prevent Your Patients From Pulling Out Their Feeding Tubes Unintentional pullouts can lead to emergency room visits, surgical consultations and replacement tubes costing thousands of dollars, valuable time, needless patient anguish and life-threatening events.1 Avanos Medical’s MIC* PEG Feeding Tube design will help eliminate these problems and deliver the security you and your patients expect. Fewer dislodgements mean: •Less spending on tube replacements and health complications1 •Fewer patient emergency room visits1 •More time for proactive patient care1 •Fewer complications due to accidental dislodgement1 Real Life. Secure Solutions. •Ventilated SECUR-LOK* retention ring allows air circulation around stoma •Multiple ports accommodate nutrition and medication delivery •Radiopaque stripe and bumper aid catheter visualization •Uniquely designed internal retention bumper Laboratory tests show Avanos Medical’s MIC* PEG Feeding Tubes collapse for traction removal but require more force than other tubes.2 •According to a recent study, PEG pullouts cost more than $20,000 in additional health care charges not including individual physician charges, hospital days, transportation, and additional time and administrative costs associated with these events.1 •The vast majority of PEG pullouts require an emergency department visit, a level 3 surgical consultation, a replacement gastrostomy tube and a radiographic confirmation of tube positioning.1 •In early tube dislodgement, the stomach may separate from the abdominal wall and the open gastrostomy may leak gastric contents into the peritoneal cavity.1 Pull PEG Kit includes: • Traction removable Pull PEG tube • 5Fr retrieval snare (1.8mm x 260cm) • Universal feeding adapter • Bolus feeding adapter • SECUR-LOK* retention ring • 5ml vial 1% Lidocaine HCl • 19G x 1.5 in. filter needle • 25G x 1 in. needle • Povidone Iodine swabstick packet • Povidone Iodine ointment • Fenestrated drape with adhesive tabs • 12ml syringe • Scalpel with #11 blade • Introducer needle • Looped placement wire • Stainless steel scissors • Stainless steel hemostat • Tubing clamp • Water soluble lubricant • 4 4 x 4 in. gauze sponges • 2 2 x 2 in. slit gauze sponges • Suture strand • Directions for use • Instruction insert, Lidocaine 1 Late accidental dislodgement of a percutaneous endoscopic gastrostomy tube: an underestimated burden on patients and the health care system, by Laura H. Rosenberger, Timothy Newhook, Bruce Schirmer and Robert G. Sawyer. Received: 16 March 2011 / Accepted: 2 April 2011 / Published online: 2 May 2011. 2 Data on file. Retention Values for Competitor PEG Tubes Report.